Prepare for your next triathlon with the HRM-Tri and HRM-Swim chest heart rate monitors for even more accurate training metrics. Helps monitor your training and recovery so you can better prepare for race day. Provides all new anaerobic training effect and training load metrics. Takes biomechanical measurements such as cadence, stride length, ground contact time and balance, vertical oscillation and vertical ratio which are vital to improving your technique. Custom activity profiles for running (indoor/outdoor), cycling (indoor/outdoor), swimming (pool/open water), cross-country skiing, paddle sports, trail running, hiking, strength training and many more. Features a big, easy-to-read color screen with powerful functionality. A MEMORABLE GIFT - Your loved one will be blown away! 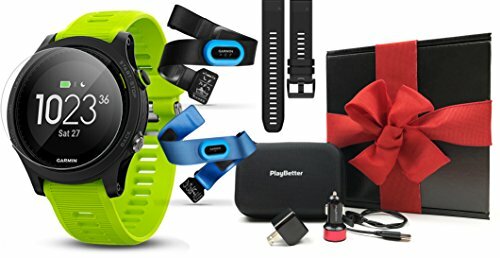 We worked hard to pick the most functional accessories for the Forerunner 935 - the PlayBetter Hard Carrying Case, Screen Protectors and Extra Band will keep the watch in mint condition while the USB Adapters will ensure it's charged at all times!